Decorating is all about balance! Ever wonder why the rooms in a magazine look so good? Ever find yourself thinking… “I can’t put my finger on it but I just don’t like that room”? More often than not, it’s all about balance! 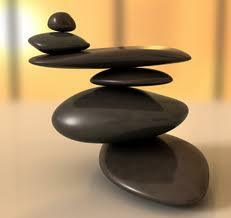 Balance is such an important part of a well designed room. So, let’s talk about it…. 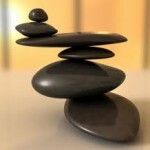 Balance is the proper distribution of form, color and texture along with using the proper placement of items in a room. It’s the ying and yang, the positive and negative, the darkness and light that give a room texture and depth. A well decorated room displays a balanced in scale, proportion, light value, space, color and texture. The contents of a room should include a mixture of small and large scaled furnishings and accessories which complement and balance each other out within the room. For example, putting all dark and heavy furniture on one side of the room and nothing visually substantial on the other side of the room will give the appearance that the room is tipping. Likewise too many hard surfaces in a room can feel cold while too many soft surfaces can make a room feel stuffy! In order to create balance, you want to mix hard surfaces with soft surfaces, dark with light, wood with fabric, etc. So the next time you walk into a room that just doesn’t feel quite right, take a look at the furnishings in that room and see if you can see the balance (or lack of) in the room! It just might give you some insight as to why the room feels a bit “off”! https://redefineddesigns.com/wp-content/uploads/2019/03/Redefined-Designs-logo-revised2017-RGB-small-for-w_e68147bef04a4c12bb7de8e8de138a0e.jpg 0 0 Jenna https://redefineddesigns.com/wp-content/uploads/2019/03/Redefined-Designs-logo-revised2017-RGB-small-for-w_e68147bef04a4c12bb7de8e8de138a0e.jpg Jenna2011-09-02 10:28:332012-04-22 08:27:39Decorating is all about balance!